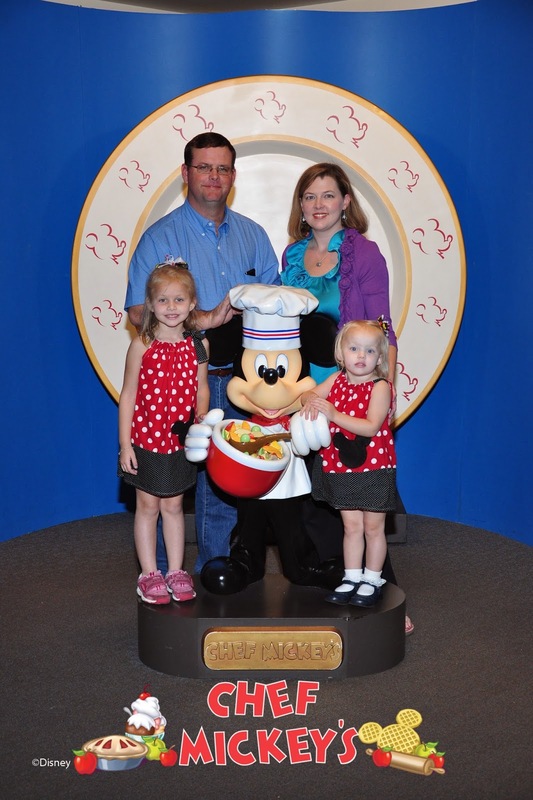 We had the best time meeting Mickey and all his friends at Chef Mickey’s. The girls adored every aspect of the dinner including the monorail ride to the Contemporary Resort. This is one of the most popular character dining experiences and reservations are a must. And start trying to make them early because they can be difficult to get even three or four months ahead of time. The meal is a buffet featuring a variety of foods and you can make as many trips back as you like. It was like a normal buffet restaurant only the food was actually good! Chad especially loved the ribs! During the meal, Mickey and four of his friends came around to each table and take pictures and sign autograph books. None of the characters speak but they still manage to joke and have fun with the kids. By the end of the meal, the girls were beside themselves with sugar and excitement! The meal includes a group picture. Here’s ours! I used the code in the top corner of the photo to add it to our Photopass, just in case we ever lost it. We had a fantastic time at Chef Mickey’s! I would definitely recommend it to everyone at least once and its a great way to meet Mickey and friends without waiting in line in the parks! Click here for all things Disney on the Bay Bush! And you can find a tutorial on how I made the girls’ dresses here!